Unfortunately, sugar is found in countless foods and beverages in our modern diet. But you don’t have to cut it out completely to reduce your risk of cavities – just minimizing it will make a big difference. Also, how often you consume it is important as well, so don’t sip or snack on anything sugary throughout the day. Remember the phrase, “Sip all day, get decay” to remind yourself not to graze. Prevention is the name of the game when it comes to your oral health, and regular checkups are a huge part of that. In addition to getting a professional cleaning and polish, these visits are important so a dentist can find and treat any problems when they’re small. For example, a small cavity can be treated with a simple filling. But if you wait until you feel pain, the cavity is large enough that it may require a dental crown or even a root canal. In addition, you get many other benefits from routine care, including oral cancer screenings and gum evaluations. Most people do reasonably well with brushing but struggle with flossing. It’s helpful to start small and set realistic goals, such as flossing 3-4 times a week. After a few weeks of doing that, it will be easier to increase it to every day. Also, if you find that bedtime is difficult because you’re too tired, try doing it right after dinner instead. Most people aren’t able to brush and floss after every meal, but there are other ways to practice quick, easy oral hygiene on-the-go. First, try to keep sugar-free gum on hand. It will increase your salivary flow and neutralize the acids that cause cavities. Second, if you don’t have any gum, you can swish with water several times to at least wash away some of the sugars and acids that remain in your mouth after a meal or snack. These days, there are countless tools on the market that can make your oral hygiene easier and more effective. For example, an electric toothbrush is practically guaranteed to do a better job than a manual. You might also try floss picks, interdental brushes or an oral irrigator (which is especially helpful if you have a lot of dental crowns, gum disease, or a bridge). 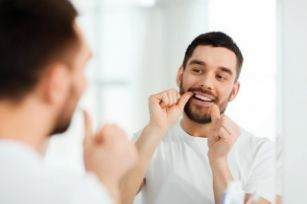 Practicing these 5 simple strategies for better oral health in 2019 will help you achieve your healthiest smile yet this year! Dr. Sarah Esparza is a family dentist in Virginia Beach with 20 years of experience. In that time, she’s seen the difference that good everyday habits make in peoples’ oral health, and always educates her patients on simple things they can do for a healthier smile. If you have any other questions, she can be reached via her website.